Online shopping for family and friends out of guilt since you won’t be seeing them. Alternating between “should I get this for them… or myself?” because you wonder if solo holidays count as “Treat Yo’ Self” days. Note: they can, but guilt-shop responsibly. Wonder where your voice went, because you haven’t really talked to anyone in the last x days. Perusing your social networks and not making faces at people uploading gifts from significant others/spouses/grandparents/pets/Santa/etc. Being genuinely surprised for people that have great news to share, included the expected engagements that always happen. No snark allowed. Turn your computer back on because the Wii isn’t plugged up, and how else are you going to stream My Little Pony? Work out like no one’s watching (because they aren’t). Catch up on all of that cleaning you’ve been meaning to do. Remember you downloaded the “Unf**k Your Habitat” app,” then start playing a game. It is an off day, you know. The floordrobe will be handled soon enough. Resist the urge to bake cupcakes until you remember you don’t have a cupcake tin. Or ingredients. Or a vehicle to buy last minute supplies for such urges. Look for muffin tins on Amazon. Regret cancelling that car rental at the last minute. You did want to buy Christmas gifts, though. Spend lots of time in deep reflection, both self-focused and outside-focused. Pray. Think about how next year will be different. Plan for next year to be different. Plan to be away next year- a cruise, perhaps? Wait, silly. Go see your family, THEN cruise. Listen to that Christmas playlist you made on Spotify just a week ago. While everyone was all ‘fa-la-la’, you were all ‘it’s not time!’ Now that it is time, you can indulge a bit. Jiggalate and all of that. Make fun of Paul McCartney’s “Simply Having a Wonderful Christmastime” and Wham’s “Last Christmas” just like you would any other year. Hear noise outside the door, and wonder if a surprise package came for you. Nope- it’s for the neighbor. Be thankful for people that do invite you to spend time with their family during the holidays, knowing you have none nearby. Sometimes, it’s a welcome experience- you get to learn how another family does their traditions, and you get a good meal out of it, too. Sometimes, though, you feel very voyeuristic, and it’s hard reconciling the words “guest” with “outsider.” It’s not the family’s fault, though. You know that very well, and will enjoy the time in others’ company anyway. Call your siblings and do your annual MST3K-esque viewing of “A Christmas Story.” Reminisce on some of those experiences you can only share with people you’ve shared a home and similar DNA with for decades. Decide on dinner. You could order duck from the Chinese joint like two years ago (the “A Christmas Story” viewing prompted this), but you may just bake some ribs because it’s Christmas, you’re cooking for yourself, and eff tradition. You’re making your own! Call/skype/G+hangout some friends who may be in the same situation as you, but thousands of miles away. Smile, laugh, and make plans to see each other. 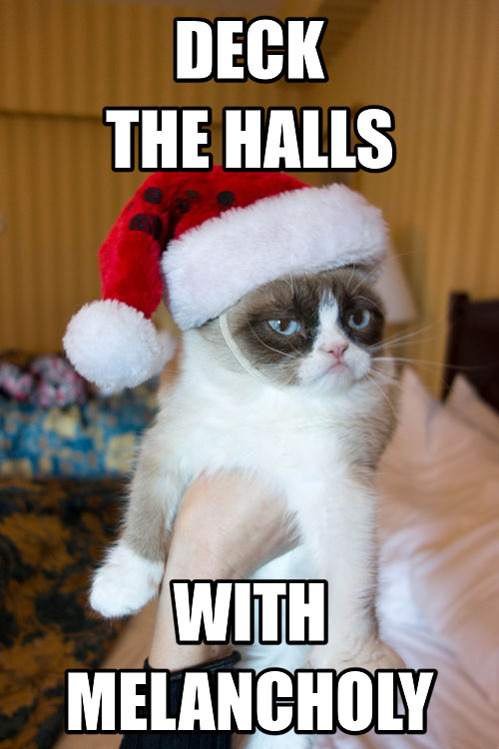 Realize that no matter how much you LOVE the Grumpy Cat meme, it’s not indicative of your general attitude towards the holiday and the love, hope, and optimism contained therein. Know that although this may be a lonely Christmas, it could be much worse. It could be a homeless Christmas, or a family-less Christmas, or an “I just lost a loved one” Christmas. Feel your heart churn for the emotions that people you’ve never seen or met may be going through. Dance like nobody’s watching (because they aren’t). So, I know I’m not the only one with the possibility of a solo holiday, or ever has spent one sans people. What did you do? How did you make it? Did you dance half as much as I am? Either way, Merry Christmas. Oh, tidings of comfort and joy. Can I even do this? I’m so rusty. All games aside, I saw a tweet this morning about National Blog Writing Month, or NaBloWriMo, that coincidentally runs along the same time as National Novel Writing Month (NaNoWriMo). I wanted to to National Novel Writing Month, but committing to 50,000 words over one of the shortest months of the year when I KNOW I’m acting a plum fool on my birthday in 3 weeks and ain’t nobody got time for that seemed a little too daunting. In any case, I find I think (and communicate) better with written word. The months I’ve taken off have left me with a vault full of experiences and observations I’m ready to share, with the occasional (okay, who am I kidding here? frequent) bit of ridiculous sprinkled in for flavoring. Who knows? Maybe next year, I’ll be ready for that novel. Stick with me, friends, and let’s just see where this thing goes. Any of my other buddies out there in the blogosphere tackling either NaNoWriMo OR NaBloWriMo? Shout it out in the comments. …actually, that’s probably the right word for it. After a brief summer hiatus/life fixing, I am back! You missed me, didn’t you? Don’t answer all at once. Seriously. Since I’m still setting up the place, expect little housekeeping-type tweaks (including the header and all of that fun stuff) every now and then. For now, though, we have some catching up to do. How have you been, by the way? First, though, I must sleep. Sweet, glorious sleep. Missed you like Geocities misses being on top. I want to take you on a brief journey in the mind of a fixer. Beware: this post may include repetitive use of one specific word. Thanks, YE for the pic idea. You don’t even know you did it. A fixer is that person you don’t know you have until you need them. The one you don’t need until there’s trouble. The one who is there despite your trouble. No matter the day or the hour, your fixer will be there with a listening ear, a solution or two, and a prayer. Like a good neighbor, the fixer is always there. What you don’t know is the extra time the fixer spends fixing things on your behalf. The hours of researching, lost sleep, thinking about your well-being, praying you see better tomorrows, wondering if they can do more for you. They do these things, not because it’s their job, but because they care. Some might mock the fixer for having a bleeding heart, but fixer don’t care. Wearing his heart on his sleeve with the matching hat, the fixer doesn’t hide any emotions. Fixer just wants to help, by any means necessary. Fixers always read in between the lines, knowing your jokes always have a slight stain of truth behind it. Fixers excel at what they do, and when you’re satisfied and walk away until the next time you need fixing, the fixer is still there. …but who fixes the fixer in the meantime? Recently, I inherited some items from a friend moving. This isn’t the first time I’ve collected such items, but as I began to make space for them, I came across things from friends and moves past. A packet of chai tea. Spare dishes. A bookshelf. Cleaning supplies. Free food (praise Him!). Little reminders that, when used, cause me to remember little moments with people. Those little moments become deep memories, that I recall with fondness. I remember that these moments, these memories, make me what I am today. Each item tells a story, linking me to a moment in time that can’t be repeated, but often relived. Though we may have been separated by distance or circumstance, the imprints left on the heart run deep.With the passing of time, I don’t treasure them any less. I don’t like moving much. My need for stability fuels that. Something about packing and going, though the acts propel you into something new, seems so finite. I joke sometimes and say I’ll likely live in my current dwelling until an outside job or the prospect of marriage seduces me away. The more I joke, the more I realize it’s not a joke- I truly believe it. I often wonder who will inherit pieces of me whenever the time comes. Do I have to itemize a list with Excel and analyze what will go to whom, and write a long letter? Do I just put everything in my living room and let people have at it? Soon enough, I realize that it will likely happen organically, as much of these friendships have. As much as my friends have become part of my story, I have to remember I am also a part of theirs. The items might be a tangible reminder of their presence in your life, but the true inheritance is the lifetime of friendship and memories shared, and those to come. All Eyez are STILL on Tupac. In 2012 A.D.
Tupac Shakur has GOT to be the hardest working man in the afterlife. Since his (widely contested) death in 1996, he has released 7 albums, and his pre-death albums continue to sell and be touted as the best by doting fans. There have been plenty of novelty “Tupac sightings” in the nearly sixteen years since his passing, much like Elvis sightings, lookalikes, and performers. Today, though, I saw something that SOLIDIFIES Tupac’s hard work above even James Brown. During the Snoop Dogg and Dr. Dre performance at the Coachella Music Festival, Tupac performed live and in the flesh… as a hologram. That’s right– the shirtless, crip walking TupacOgram was performing like he was really there, in the flesh. And I was totally weirded out by it. Joining the headliners for a rousing performance of “California Love,” HoloPac also took time to perform his hit “Hail Mary,” right before the lights went out… I mean, his time was up. He kind of vanished, and everyone was left musing about what just happened. Eminem also performed (though he wasn’t a hologram, as I originally thought), and I was left during the rest of the set musing on how creepy it was. So, like any other normal human at 1:30 am, I tweeted my thoughts, below. Read from bottom to top, of course. Coffee + holograms of dead guys = overactive imagination Beez . Better yet, I’m sure these holograms take time and exorbitant amounts of money. Who do you see celebrities wanting to bring back just one more time? I’m sure Drake, Missy Elliot, and Timbaland would collaborate on bringing back Aaliyah. Rap artists would bring back Nate Dogg to resume singing hooks. The #Thrillermaker would be brought back to, you know… spin and make it rain glitter and whatnot. Actually, that topic is getting a little too horrific for me. Honestly, I’d just prefer if folks would let the dead stay dead. Holograms now, but will we be trying to animate full on corpses sooner or later? I said I was going to stop. You know what, though? This is proof that we are truly living in the future. We are getting closer and closer to living the Jetsons lifestyle. What do you all think of this performance? Would you be antsy to see a deceased loved one or celebrity right there in your face, or would you run away? If you had the chance, who would you bring back in holographic form? With all of the writing I do here, people could say that they know quite a bit about me. However, one side that I don’t share as often on here is my spiritual one. I actually blog some of my thoughts and perceptions from that journey in a separate space, and leave the shenanigans, random musings, and pop culture here. One practice I’ve really been trying to get into more is being more aware of the people and things I appreciate. During my reflection times, I try to keep track of things I’m thankful for overall, that day, and sometimes that minute. These things range from the mundane and shallow to the serious, life-altering issues. For me, it’s an exercise in awareness of self, awareness of others, and awareness of life. Perhaps Thankful Thursdays will become a more frequent feature as I just strive to… think better. I even made a logo! Another day not promised that I was given. Countless opportunities to do things for others. My dad getting to celebrate his 50th birthday this week-it’s not been the best 50 for him, but he’s gotten there. This mild, underwhelming winter- I’ve not had to wade in knee-deep snow just to get to the bus stop, and I’m not complaining about it. Friends and family who check on me, especially when I’m not taking care of myself. I’m learning to better help others, I’ve got to be a better me. Those knowing glances from people that say so much, that additional words aren’t necessary. Those creepy geese in my park backyard being gone. For now. The ability to write where my verbal skills escape me. Seriously- I can be in the middle of a conversation, and all of a sudden, my mind goes blank. What follows is usually something completely asinine, like “duh- oranges are subservient?” I’m glad my writing helps in that. Hugs, when I can get them. I am quite selective of who I let in that space, but sometimes, you just need a hug at the end of the day. Videos of babies, puppies, or babies and puppies on YouTube, because they brighten the days of everyone within a 15 foot radius of me. The ability to hide everything (and everyone) that annoys me on facebook, including that scrolling side-ticker. Connecting with people from the most unlikely of sources, including Twitter. They make all of my out-of-town experiences that much more… everything. Music and chicken. No further comment. What kind of things are you thankful for? I don’t mind if you’re shallow or deep- share all of your happies. Pinterest is Evil and I’m Not Exactly Sure Why. I Love Charts may be onto something. About a week ago, I decided to drink the Kool-Aid. You see, this site Pinterest has been out for a while now, allowing people to create virtual “pinboards” about whatever their hearts desire. From the beginning, I was staunchly against it. Reports have come out recently stating the site has been reaching record numbers traffic-wise, and I couldn’t understand why. The site apparently attracts a high percentage of females compared to males, creating endless visions of weddings, clothing, and generally domesticated stuff. Given the goal of my tumblr (my attempts at being girly and whatnot), shouldn’t I have jumped on this train a while ago? I mostly figured it was like tumblr (another semi-micro-blogging platform I use) for housewives and crafty housewives-in-training. The text that started it all. I recharged soon after. Super Crafty Something or Other- We get it. You like making things. You knit, sew, paint, reupholster, and découpage like no one’s business. You’d DIY a TV if you could. There’s nothing wrong with this at all. Not to say that I’m not in awe of your skills, because I clearly can’t craft my way out of a paper bag. Let’s just say I’m slightly jealous of your skills and that somewhat annoys me. I’ve Seen How You Dress In Real Life- So many “My Style” boards, which to me, suggests items that the user would currently wear, or already owns. For many users, “My Style” translates to “My Fantasy.” Runway models and sleek styles abound in this board, yet your personal brand looks more inspired by Lea Michele’s character (granny + toddler) on Glee? Not that there’s anything wrong with that, but just be you. You NEVER Eat That!- Some of my friends have tastes so refined (read: picky) that it’s a wonder that they ever do eat. All of a sudden, on Pinterest, you become a well-seasoned foodie, liking and repinning things you likely wouldn’t even sniff. I find this brand humorous, because as a picky eater (with exotic tastes) myself, you won’t catch me liking a bananas foster, no matter how many people have liked or repinned it. The verdict’s still out on whether I’ll continue to pin, or if I’ll go the way of deactivation until I grow up and decide to do something (or ALL the things!) myself. I suppose I’m still trying to find my niche in this huge world of pinnery, and need a little guidance as to where to start. Perhaps once I unfollow all of the ‘dream wedding’ boards, I’ll have something to look forward to. So, the question for you is- Have you or do you currently use Pinterest? What value are you getting out of the site? I look forward to your answers. * I have two siblings- fun fact. Grannies Win at Life. Always. Grandmothers are special. From the time we enter their lives, a bond is formed that can’t be duplicated or replaced. I remember both of my grandmothers fondly: memories of fried chicken, celebrity gossip and talk shows, flood my mind more often than I’d like to admit sometimes. These were the ones who took my side over my parents in any of my tween angst issues. One lived in Florida, and the other down the street, and no matter where I was, whenever I talked to them, I was home. I remember the boxes of oranges and grapefruits sent every winter, picked from the trees in the backyard. They tasted like love. Anyway, one thing I really adore about grandmothers is that they can delve into popular culture, and be the talk of the town. No one boos grandmothers like they would cheesy mothers and fathers trying the same thing. In fact, we cheer them on with enthusiasm, glossy eyed at the cuteness they radiate. You remember the rapping granny from The Wedding Singer? She said a hip, a hop, a hippy, and we bopped along. Grannies + Ratchetness = Winning at life. Rack City Grandma- I had never even heard of this song before this video. In usual YouTube fashion, a teenager is lip synching to this anthem of… whatever, while in the background, the true star shines. Grandma went to work and hit her cat daddy. Three Six Granny– Grandmother raps along to the lyrical stylings of Academy Award winners Three Six Mafia. She actually catches the flow and all while son does some kind of frenetic twitching in the background. I’m not a big fan of this song, and I haven’t even heard it all the way, but… extreme language on this one. She’s like a dirty version of the Rapping Granny from America’s Got Talent. Granny Pats Her Weave– Don’t get in this granny’s way when Beyonce comes on- she is trying to get bodied (whatever on Earth that means). Y’all see how she has that back it up and bounce move executed perfectly on that walker? She even strolled around it for a little bit of model walking that would make Tyra Banks proud. Granny Hitting Usher Moves- Remember back in the day when Usher was a cherubic crooner who only had to worry about what girl to walk home from school? When The Box was still music television we controlled, a certain video featuring 5, count ’em, FIVE Usher Raymonds, jigging across the screen to one of his biggest hits, “U Make Me Wanna.” My siblings and I would watch, memorize, and perform the choreography live from the living room, often arguing over who would be which Usher. I preferred guitar strummer-Usher. Looks like this grandma got her review, learn, repeat on, too. And HIT IT. The Electric Sliding Elder Club- I’d be doing you all a disservice if I didn’t introduce you to some of my favorite dancing elders. Well, actually, it’s a group featuring all ages called Step In The Name of Life (see what they did there?) a community based organization seeking to better people’s overall health, that posted videos of its students learning all of these slides I never knew existed. One day last summer, I stumbled upon their videos, and like anything you shouldn’t, I kept watching. What did I learn? Every song has a slide. EVERY SONG. HAS. A SLIDE. Enjoy! Dear ones, enlighten me with your zany grandmother tales in the comments- what kind of adorably ratchet, off the wall things do they do that make your day? 1 Not that there’s anything wrong with cat videos, but I can’t watch too many. I’m allergic, and the videos almost make me sneeze sometimes. 2 RIP, Myspace. We hardly knew ye. Or really wanted to.